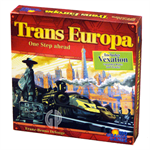 Drake says: "TransAmerica is very simple railway game. Each player has a set of 5 cities strung across the United States that need to be connected by rail. 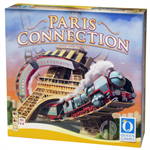 Players may place either 1 or 2 rails each turn. The player who can make the best use of the other players' networks is generally victorious." John says: "TransAmerica is very light and entertaining. This game is truly a gateway game. 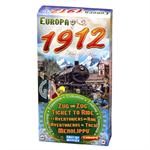 It has a similar them to Ticket To Ride, but requires use of other players' rail placements. This is an excellent family game for new players and seasoned gamers." America in the 19th century: railroads are booming! Pioneer spirit and vision are everywhere. Everyone wants to be the first to build a railroad network across the country. Each player gets a set of five cities and must build a network (with the help of the other players) to connect all five cities. The first player to connect his five cities wins the round. The others lose points based on how far their unconnected cities are from the network. Who will be the first to connect his cities? 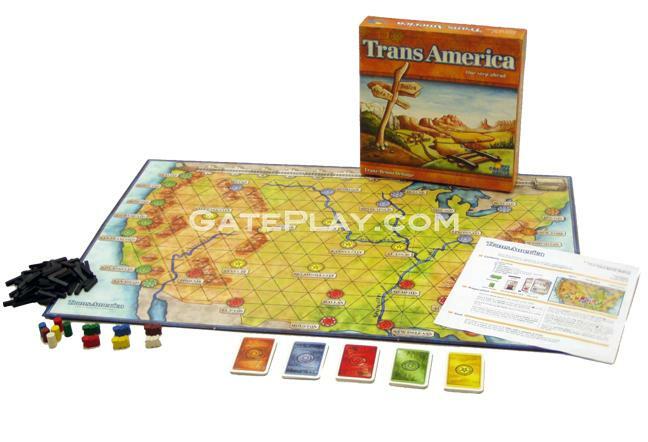 Check out "TransAmerica" on BoardGameGeek.com! Check out "TransAmerica" on KidGameRatings.com! 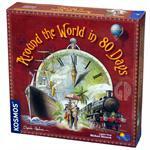 Hunchy says: "If you enjoy travel games, you'll also enjoy Ticket To Ride and Around The World In 80 Days." Light intro game, solid replay, not amazing. I think it is a good game to have in a collection. It's not the most complex of games, but that's its charm. The game works well with 2-6 players which is nice for those big groups. The game has flaws, there's a fair bit of luck, but it isn't meant to be a super strategic game. It's simpler than Ticket to Ride, so if you think Ticket is too simple, don't bother with this. I like Ticket better, but I still think TransAmerica is worth owning.